George Lucas has only directed six features, with four tied into a series you may have heard about called Star Wars. I grew up loving those films and the Lucas-produced Indiana Jones movies during the '80s. Somewhere along the line, he morphed from a filmmaker into a corporation, and this change is exemplified in the stunning, yet empty prequels. For this week's entry in the List of Shame marathon, I'm journeying back to the days when Lucas was an idealistic novice trying to make his name in the industry. His debut feature THX 1138 received a lukewarm response, so he ventured into a different sphere with his second picture. Will the '60s nostalgia of American Graffiti strike the right nerve or send me yearning for his adventures in a galaxy far far away? Let's get to the questions to find the answer. In the summer of 1962, Curt (Richard Dreyfuss) and Steve (Ron Howard) enjoy one last night on the town in Modesto, California before leaving for college the next morning. Along with friends Terry (Charles Martin Smith) and John (Paul Le Mat), they enjoy a series of fun adventures while driving around town. The early rock 'n' roll sounds from Wolfman Jack's radio show play in the background as these guys seek out romance. Curt is trying to locate a blond girl (Suzanne Sommers) who gave him a a quick glance from a nearby car, while Steve can't decide how he feels about girlfriend Laurie (Cindy Williams). John finds himself escorting a young teen (Mackenzie Phillips) that threatens his image, and Terry shares a wild night with Debbie (Candy Clark) after borrowing his friend's car. The characters' paths cross as they roll through the diners, school dances, and the town's other nighttime venues. There's no clear reason why I hadn't seen American Graffiti to this point. Its episodic structure and focus on a short time period are definitely up my alley. I think the laid-back style kept it from being a must-see movie that's constantly recommended by other film fans. Despite its pedigree, you don't hear that much about this picture compared to the flashier choices from the early '70s. Another factor is George Lucas, who's tarnished his reputation with the Star Wars prequels and his incessant tinkering with the original trilogy. It's hard to remember that he directed a few interesting movies before the abundant success changed him forever. 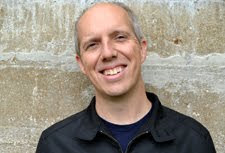 Lucas was an underdog filmmaker trying something a bit different here, and the result was a massive hit that gave him the chance to make Star Wars. Similar to last week's Stand by Me, this story maintains a timeless quality because it's a period piece set at a particular time and place. This nostalgia factor is on full display here, especially since the events occur one year before the Kennedy assassination. 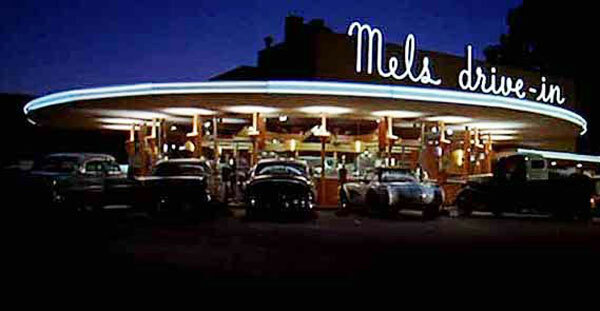 From the first notes of Bill Haley's "Rock Around the Clock" playing over the image of Mel's Drive-in, the sentimental feeling pervades the story. They take place in 1962, but the prevailing tone owes more to the '50s than its actual decade. The style and music embody a yearning for a time before Vietnam and the crazier times in the late '60s. Despite this old-school approach, the excitement remains because it's a convincing look at a specific time period. The clothes and cars also work because some elements have come back in style in recent years. This brings a strangely modern look to designs that are at least 50 years old. One of the strengths of American Graffiti is its believable characters, who seem like average high-school kids from a small town. Some are better-looking than others, but everyone gets the chance to have a good time. Nicknamed "The Toad", Terry isn't likely to get much attention from girls. However, his new confidence from driving Steve's car gives him the nerve to approach the attractive Debbie. Even when his wild tales are revealed as lies, she doesn't kick him to the curb. Another strong example is John, who's the street-racing king with a cool ride. He puts off a rough exterior, but that eventually melts during an odd night with the young Carol. They develop a cool platonic bond, which easily could have shifted into creepy territory. There's also a brief appearance by Harrison Ford as Bob Falfa, a wannabe street racer who's got a cool hat but doesn't connect with the youngsters. Basically a collection of loosely connected scenes throughout the night, this story includes plenty of entertaining moments. Curt's interactions with the Pharoahs street gang are enjoyable because of their mix of menace and goofball charm. He's basically a harmless guy, but even he can't resist the chance to cause a little mayhem. Richard Dreyfuss stands apart from the cast and shows the promise that would lead him to a prominent career. Playing a teenager at the age of 26, he doesn't seem out of place because of the youthful glint in his eye. When he arrives at the radio station and meets Wolfman Jack, Dreyfuss plays the scene just right and doesn't overdo it. Another fun moment involves Terry's attempts to get someone to buy alcohol for him outside of a local shop. His frustrated tries ultimately pay off thanks to a laid-back stick-up man, which provides one of the most overtly comic scenes. My expectations weren't super high for American Graffiti, so the result was actually a pleasant surprise. The major reason is the excellent soundtrack, which plays constantly from the car radios of all the kids in town. More than 40 recognizable tunes ramp up the nostalgia but also help push the story through any of the duller moments. One glaring issue is the text epilogue, which comes out of nowhere and feels completely unnecessary. While it's fun to follow these characters for one night, learning that one was killed by a drunk driver and another died in Vietnam brings a strangely hollow tone to the conclusion. I expect that Lucas intends to show how this night represents the end of an innocent time for these characters (and the country). However, putting such a blatant stamp on this theme is obvious and manipulative. Regardless, the overall story is well-done and entertaining. I'll just choose to forget the final text and remember the rest of it. Next week, I'm staying in the '60s but getting rowdier on campus with Animal House. I had the exact same reaction to the epilogue. After such a fun and ultimately charming movie, that epilogue puts such an emotional damper on things. I'd also suggest that in addition to the terrific soundtrack, American Graffiti offers some proof that Lucas isn't completely incapable of writing decent dialogue. Steve, you make a good point about the dialogue. I think the important thing was that Lucas collaborated with Gloria Katz and Willard Hucyk on this screenplay. This is one of the reasons Empire is so good. Lucas didn't write it on his own and had Irvin Kershner direct it. Left to his own devices (i.e., The Phantom Menace), the result can be ugly. Lucas needs someone to ground his ideas. Thanks! For what it's worth, the sequel More American Graffiti showed that at least one of the text descriptions was misleading. It's not as good as the original, though, so I don't know if it's worth watching just for that. Chip, I haven't seen the sequel, but I'm guessing they just ignored the epilogue so they could bring back one of the actors, right? It doesn't sound like it's that great, so I probably won't check it out. Actually they had all the characters back, but showing them experiencing things on different days and years. For instance, we see the last night of the guy who would be killed in a car accident (mid 60s? ), the Vietnam experiences of the guy who the epilog said was missing and presumed dead (late 60s), and war protests by the couple (early 70s). None of what we see in the sequel contradicts the epilog; it just shows that for one of them there was more to be revealed about the fate. The sequel is nowhere near as good - there's not a speck of charm to be found and it's actually quite depressing overall. Chip I might even argue that none of the original characters are in the movie - sure they all have the same names and are played by the same actors, but all the interesting characteristics have either been ditched or blown up to cliche heights. I didn't care a wit about any of th epeople in this film (except maybe for the race car driver). Bob, that's really interesting about the different aspect ratios in the sequel. I guess they were trying to differentiate between the stories, but it sounds like a clunky approach. Thanks! My father's all-time favorite film with a bullet. Thinking about the scene where The Pharoahs have their fun with the police cruiser always brings me a smile because my dad always laughs at when he sees it as if he was watching the gag for the first time. I've also always been drawn to the way the story is completely contained to one night. It completely embodies those endless summers one experiences as a teenager, and never seems to recapture as they age. I've always thought this would make a brilliant double-feature with DAZED AND CONFUSED. Ryan, I definitely agree about the one-night element of American Graffiti being great. Dazed and Confused came to mind while watching it, as both have a large cast and unpredictable nature of being a teenager like you mention. Thanks! Easily one of my favorite film soundtracks of all time. It includes a lot of actors that had much bigger futures in front of them than could ever be imagined. Glad you enjoyed the film too Dan. Max, you're right that the soundtrack is great. There are so many classic songs in there, and the way it's used in the film as a backdrop for everything works really well. Thanks!